The last day of the IA Summit is always a bit bittersweet. On one hand your mind is so full of great ideas that you want to get back to the real world to put them into practice immediately. On the other it feels like summer camp where the time just flew by and only five minutes ago you were sitting down for the opening keynote. This year's last day was bookended by an insightful exploration of using sandboxes rather than paths and a phenomenal closing plenary by Peter Morville. In between were several more excellent talks, a meeting of the IA Institute, and a chance to catch up with some of the brightest people in the world. Sitting in on a Stephen Anderson presentation is always a wonderful experience. He is one of those gifted people who could make a talk on the Weather Patterns of Belgium appealing. Today's topic was to explore how persuasive psychology can help designers craft better experiences. Not everything needs to be a linear path. Following a short coffee break came a thoughtful presentation on how hidden signals can communicate much more than simply the spoken word. For me this was helpful in confirming my suspicions that face-to-face interaction is a valuable part of the design process. Even with Skype, Adobe Connect, and many other screen sharing tools there is lots of value in being physically collocated. Everybody has heard the story of the button change that brought in $500,000 more revenue. How many designers have thought about the flip side? What about a bad user interface that cost a Fortune 500 company a large fine from the SEC for breaking regulations regarding press releases? Aaron and Matt demonstrated part of their internal process to show that sometimes poor design can be more costly than no design at all. While I have my suspicions that as one of the co-directors of the IA Summit Aaron may have rigged the Flex Track selection process to his advantage it was an excellent talk nonetheless. Having worked for a number of years on both waterfall and agile projects I am very familiar with the concept of technical debt. Only recently was I exposed to its cousin - 'UX Debt'. Andrew Wright not only outlined the ways in which projects can develop this problem but provided attendees with some good suggestions for tackling it when it inevitably arises. Despite missing a talk on Imposter Syndrome I had no regrets on choosing this presentation. Closing keynotes are always a bittersweet time. On the one hand they provide a great opportunity to inspire as everyone heads back to the real world. On the other it marks another year before the IA Summit comes back around. 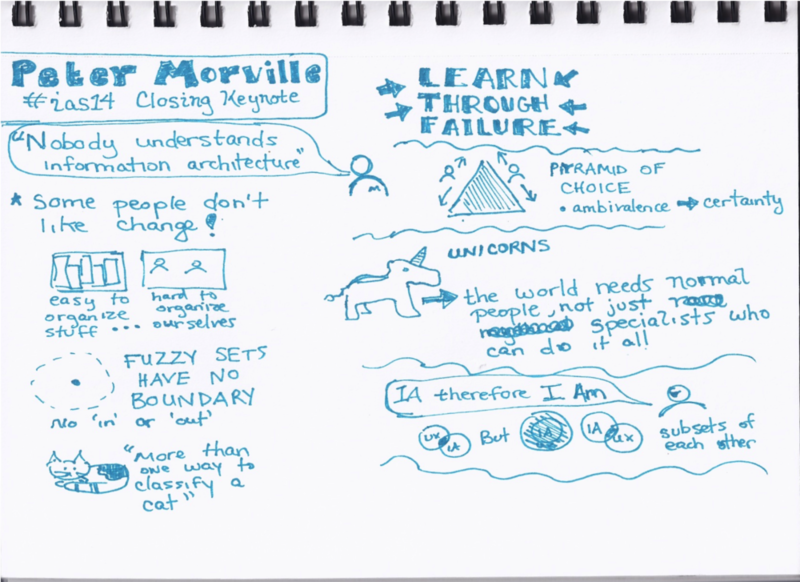 This year's closing speaker was none other than Peter Morville. Another one of those speakers whom never disappoints he chose to leave us all with his thoughts on what it means to be an Information Architect.